So, the last week-plus I've been working on the game off and on, I think I'm actually past my first trac milestone, need to update that at some point. Everthing's pretty much in place and going now, so a (quick-ish) progress report is in order. - More or less finished the Cocoa/Xcode development book I was reading (I haven't read the stuff on dealing with dispatch queues or anything, but I was tired of reading instead of coding and I've already covered the critical stuff. This project probably won't be compute-intensive enough to use those, anyway). - Built the interface framework in Xcode, started on galaxy/system/planet generation code; in parallel I'm working on the debug interface. I figure I'll do my first serious interface there, so by the time I get to the user stuff it'll be a bit more polished (mostly on the code side; polished interfaces are easy to build in the Xcode Interface Builder). That's one star per spectral type, plus neutron stars and black holes. 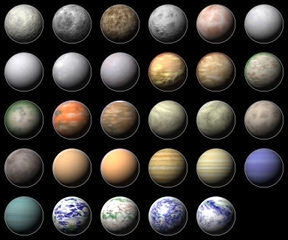 There are also ten classes (so far) of planets (categorized by atmosphere) but I did up several versions of each class for visual variety (at least two per class, more for common or interesting classes). Three of the classes are invented; the rest exist in the solar system (you might recognize some). I could do more easily if things felt too repetitive; all the planets and stars are Lightwave3D objects or scenes and easy to regenerate or modify. And that's pretty much it so far. Exciting times ahead. Let me know when you reach alpha and I can help you test. Well, you'd need a Mac to play it on; I'm writing it in Xcode, after all. But you'd be welcome to come over and try it out when it gets to that point. No, not a space shooter. A 4X game.